An excellent source of Omega-3 Fatty Acid, EPA and DHA. 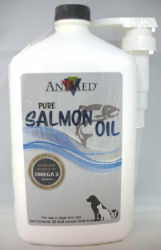 Salmon Oil is a premium supplement for animals of all ages and classes. Dogs and cats feed 1/2 teaspoon per 10 lbs. of body weight once or twice daily. May be mixed directly with food. As a general rule of good feeding practices, Salmon Oil should be introduced gradually. Amount and frequency may be varied as necessary or, as directed by a veterinarian.